A murder probe has been launched after the death of a man who was found injured in a Doncaster park. South Yorkshire Police said a 65-year-old man was found collapsed in Hexthorpe Park, Hexthorpe, at around 4.40am yesterday. He was taken to hospital but could not be saved and was pronounced dead a short time later. 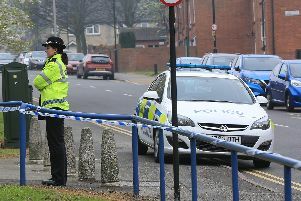 A 17-year-old boy and an 18-year-old woman have been arrested on suspicion of murder and were yesterday still in custody. Part of the park, close to the bandstand, was sealed off and under police guard while officers carry out enquiries at the scene. Residents spoke of their shock as police carried out their investigations.